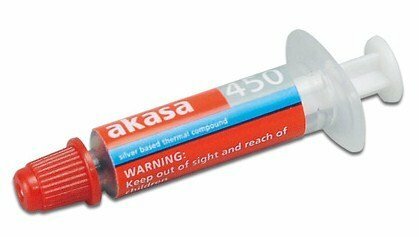 Akasa reveals the AK-450-SS, a new silver-based thermal compound that promises thermal conductivity of 9.24 W/(m·°C) and minimal staining when removed. It will be available in 1.5g syringes, and will start shipping in Japan on August 7th. The AK-450-SS from Akasa is a silver-based compound that offers thermal conductivity as high as 9.24 W/(m·°C). The company did not give out viscosity information, but mentioned that it can handle temperatures as high as 200 °C, without "bleeding" out. The compound is also engineered to leave minimal staining when removed.